The following collection is surely not complete, and I can't guarantee the mentioned topics to be available, but they are offered at the time. There surely are some other shops which offer the same topics, we do not want to favour special companies.
! I want to thank everybody who helped keeping this list timely by sending information! Hint: Some Karl-May movies have been released in May 2005 with English version, too! For more information see below. For our english speaking visitors: Karl May Books in English! Nemsi Books publishes English translations of Karl-May books. Karl-May books in English, translated by Marlies Bugmann of the Australian Friends of Karl May are available for example at amazon.com. 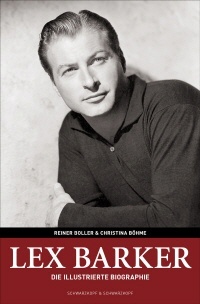 Christina Böhme Schwarzkopf & Schwarzkopf-Verlag 978-3-89602-908-9 A new edition of Reiner Boller's Lex Barker biography (German Language only). The new edition contains new interviews with contemporaries, new pics and other stuff. "Mr. Old Shatterhand" — Sein Leben — Seine Filme Arild Rafalzik Filmland Presse München 3-88 690-200-5 Arilds biography (German Language only) is filled with nice pictures and Lex Barkers lifestory, worthwhile to by even if you don't speak German. Lex Barker und seine Filme Manfred Christ Günter Albert Ulmer Verlag, Tuningen 3-924191-81-6 More than just a filmography! This book is mainly filled with pics and posters and movie stills from Lex Barker. Karl-May-Filmbuch Michael Petzel Karl May Verlag 3-7802-0153-4 2nd edition with a lot of additinal material! Very interesting book with lots of details about the making of the "Karl-May-movies" of the sixties, with bios and many pics, very recommendable! Der Weg zum Silbersee Michael Petzel Schwarzkopf & Schwarzkopf-Verlag 3-89602-358-6 Sets and shooting of the Karl-May movies in a colorful pictured book! About 280 pages and 300 photos! Karl-May-Stars Michael Petzel Karl May Verlag 3-7802-0162-3 Portraits of the main actors and a lot of so far unknown pics! Sein Leben-Seine Bücher, seine Filme Jörg Kastner Bastei Lübbe Paperback 3-404-28206-X Short biography of Karl May, the main part of the book tells all about the movies - the old ones, too. Interesting! Out of print, try ebay! Das große Album der Karl-May-Filme Bd. 1 Editor: Michael Petzel Schwarzkopf & Schwarzkopf-Verlag 3-89602-469-8 Most impressiv huge film strip! Das große Album der Karl-May-Filme Bd. 2 Editor: Michael Petzel Schwarzkopf & Schwarzkopf-Verlag 3-89602-479-5 Most impressiv huge film strip! 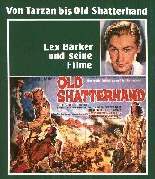 Old Shatterhand — Filmbildband Michael Petzel Karl May Verlag 3-7802-3013-5 Like the movie film strips of the 60ies. 1567 Filme von 1894 bis heute Joe Hembus Heyne Filmbibliothek 3-453-08121-8 New edition by Benjamin Hembus. Essential for Western-Fans (deals only with films that ran in Germany); contains all western movies with Lex Barker that were shown in Germany (cinema or TV) and all Karl-May-movies that take place in the Wild West. Out of print? Brad Harris — "Ein amerikanischer Bayer" Reiner Boller Gryphon Verlag 3-937800-55-7 Contains anecdotes about Lex Barker and "Mr. Dynamit - Morgen küßt Euch der Tod", where Brad played "Cliff". Gustavo Rojo: Abenteuer von Tarzan bis Winnetou Reiner Boller Marheinecke 978-3932053672 Contains infos to the five Karl-May movies, in which he appeared! Das große Album der Karl-May-Filme — special edition Editor: Michael Petzel Schwarzkopf & Schwarzkopf-Verlag 978-3896027276 Limited edition, every book autographed by Marie Versini. Additionally to the beyond mentioned DVDs there are a lot of collections or boxes with Lex Barker films in different combinations with other movies (cloak and dagger, western, adventure...) which change so often that I can't mention them. Please note: I don't list videos anymore! Please note: PAL format will probably not play on U.S. DVD players (maybe on computers). DVDs in PAL format are generally region code 2, which will not play on U.S. DVD players! Infos on film formats in general and especially the Barker-DVDs! You can show the entries according to the date of entry or to the year just like the filmographie. 05-27-2006 Winnetou und Shatterhand im Tal der Toten 1968 German DVD-PAL Together with "Old Shatterhand" in the "Shatterhand box"
English DVD-PAL 16:9 There is an interview with Lex as additional material.There are different DVD versions, among them NTSC format DVDs, available. 12-10-2014 Mr. Dynamit - Morgen küßt Euch der Tod 1966 German DVD-PAL 16:9 Released by Pidax-Film, contains interview with Dr. Hechelhammer from the BND as bonus. 03-01-2005 Im Reich des silbernen Löwen 1965 German DVD-PAL 2,35:1 In DVD box together with "Der Schut" and "Durchs wilde Kurdistan"
03-01-2005 Durchs wilde Kurdistan 1965 German DVD-PAL 2,35:1 In DVD box together with "Der Schut" and "Im Reich des Silbernen Löwen"
03-04-2008 A Place called Glory 1965 German DVD-PAL 16:9 Together with "Wer kennt Jonny R.?" in "Lex-Barker-Collection-Box" (2 DVDs)! 01-29-2006 Pyramid of the Sun God 1965 German DVD-PAL Together with "Schatz der Azteken" in "Mexiko-Box"
03-01-2005 Der Schut 1964 German DVD-PAL 2,35:1 As DVD box together with "Durchs wilde Kurdistan" and "Im Reich des Silbernen Löwen"
05-27-2006 Old Shatterhand 1963 German DVD-PAL 2,35:1 On DVD in "Shatterhand"-Box together with "Winnetou und Shatterhand im Tal der Toten"
02-10-2014 Il Boia di Venezia 1963 German DVD-PAL To be released in 2014 in the original cinema version. 07-16-2005 Die unsichtbaren Krallen des Dr. Mabuse 1962 German DVD-PAL 16:9 On DVD in Mabuse-Box by Universum with 6 films, among them both Barker films! 04-18-2014 The Yellow Mountain 1954 German/ English DVD-PAL 16:9 To be releasedc on June 12th 2014 at "Koch Media Western Legenden"
06-01-2012 Tarzan and the She-Devil 1953 English DVD-NTSC 4:3 all Lex-Barker-Tarzan movies in Box released in USA, see Warner Shop. 06-01-2012 Tarzan's Savage Fury 1952 English DVD-NTSC 4:3 all Lex-Barker-Tarzan movies in Box released in USA, see Warner Shop. 06-01-2012 Tarzan's Peril 1951 English DVD-NTSC 4:3 all Lex-Barker-Tarzan movies in Box released in USA, see Warner Shop. 06-01-2012 Tarzan and the Slave Girl 1950 English DVD-NTSC 4:3 all Lex-Barker-Tarzan movies in Box released in USA, see Warner Shop. 06-01-2012 Tarzan's Magic Fountain 1949 English DVD-NTSC 4:3 all Lex-Barker-Tarzan movies in Box released in USA, see Warner Shop. 01-01-2009 Mr. Blandings builds his Dream House 1948 German/ English DVD-PAL 4:3 In Cary-Grant box 3. 03-01-2014 The F.B.I., ep. "Three Way Split" 1971 English DVD-NTSC 4:3 The 6th season is available at amazon.com, in which Lex is in one episode! 01-24-2016 Rudi-Carrell Show 1971 German DVD-PAL 4:3 To be released on March 18th 2016 bei Pidax! 2 films of each box are in German and in English, too! For more information see Universum-Film (German language only) and dvd-inside.de. Information on the English dubbing can be found on the dubbing page now. Available for example at jpc for 16,99 Euro. Here are some Sound bites and pictures taken in the studio while recording these songs! If you don't understand the text - don't mind, it's not worth translating it, but the melodies are very nice and Lex' voice is simply great!